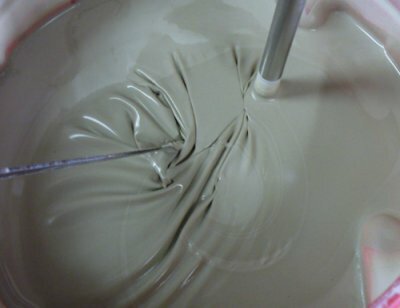 Deflocculation is the process of making a clay slurry that would otherwise be very thick and gooey into a thin pourable consistency (it is the opposite of flocculation). The magic of this process can only be appreciated when you see a thick mud transform in watery liquid with the addition of a few drops of dispersant (under mechanical mixing action). Deflocculants are electrolyte-sourcing liquids or powders (like sodium silicate, Darvan) that are added in small amounts. They work their magic by imparting electrical charges to clay particles making them repel each other (more accurately it is said to be a condition where repulsive forces predominate). Over-deflocculated slurries tend to be sticky, livery and settle into a hard layer at the bottom. Under-deflocculated slurries gel. A casting slip is a delicate balance of water, powder dynamics, deflocculant, temperature and mix energy (as any of these vary so does the properties of the slurry). Once you have used a slip that has been properly formulated and deflocculated for casting you will never go back to using an inadequate one. 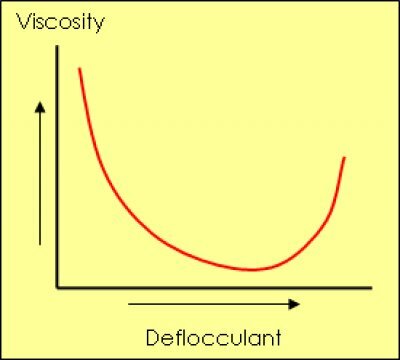 Deflocculants change the viscosity of a slurry without changing its specific gravity (adding water to a slurry changes its viscosity by reducing the specific gravity). Thus, to deflocculate a slurry properly it is very important to be able to measure its specific gravity and viscosity accurately. Typical casting slurries have a specific gravity between 1.7 and 1.8 (although some are up to 1.825). 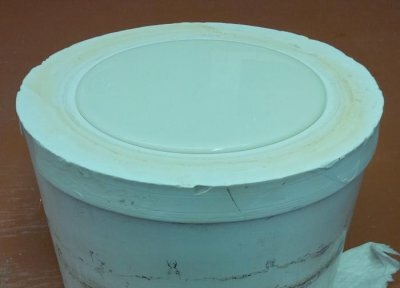 A bucket of 1.8 SG slurry is very heavy (1.8 times heavier than water). 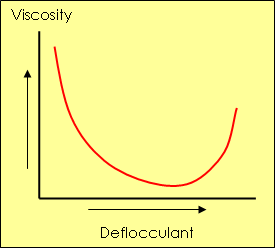 Different types of deflocculants are used in different percentages (for a given specific gravity). This percentage, 0.75% of the dry powder, is large. Some commercial deflocculants (e.g. those used in sanitaryware) are effective in percentages as low as 0.1% (they cost much more but you use much less). The amount of deflocculant required increases with specific gravity and, at some point, further additions become ineffective. Each product has its own characteristics in this regard, so determining the best compromise between the utility of the slurry and its cost requires patience. It is best to focus on slip quality and stability at first and make small changes with time to reduce costs (e.g. raise the specific gravity). One manufacturer finds that a 30% water content delivers 1.72 specific gravity, the low deflocculant requirement and easy adjustability of the slurry make this conservative approach cost effective. Casting recipes "recommend" water and deflocculant amounts. Quality recipes indicate what specific gravity the recommended water content produces. This is a very important concept since casting recipes do not travel well. Users "adapt" a recipe to their process. This is so, both because of all the variables between different production sites (e.g. water electrolytes, material moisture and solubles, temperature, mixing equipment, etc) but also because priorities differ. Variations in water and materials also occur at the same location (with different shipments and seasons). A factory places a much higher priority on using the highest possible specific gravity (to minimize mold wetting) and is prepared for the extra burden of slurry maintenance (they also have the powerful mixing equipment needed). A potter is likely willing to use a slip of lower specific gravity to benefit from the easier mixing and maintenance. A potter might propeller-mix a slurry for minutes, a factory for days. Thus, mixing a new recipe for the first time is a matter of discovering the amount of water and deflocculant you will need to make it work in your process with your priorities. Depending on the power of mixing equipment available a target viscosity (TG) is set. This TG compensates for the mixing equipment (more viscous if mixing equipment is powerful and slip mixing can be done for many hours, since that will thin the slurry). Generally this means starting with about 95% of the recommended amount of water and about 75% of the recommended deflocculant. Material is added quickly at first (while mixing) and more and more slowly as the slurry gets heavier and heavier. As the slurry becomes too viscous in the latter stages of adding the dry powder it must be determined if water or deflocculant is needed. A little of the deflocculant held in reserve is added. If a quick response is noted (a thinning of the slurry) more powder is added, otherwise the water held in reserve is added. This process is continued until all the powder has been added (but hopefully not all the deflocculant). The objective is to mix all the powder into the slurry while assuring its viscousity is a little higher than the TG. Then, something very important is done: The specific gravity (SG) is measured. Since the viscous slurry will not float a hydrometer a weight-volume method of measuring it must be employed. If the SG is above target, water is added and another measurement done. If it is below target a note is made for the next batch and this batch is accepted as off-spec (meaning that less deflocculant will be needed and it will soak molds faster). If the SG is near target, then more deflocculant is added (but only to reach the target viscosity). Finally, the slurry is power mixed for the longest possible time and fine-tuned. Notes are kept regarding changes needed in mixing the next batch. Potters are mostly unaware of the lengths industrial technicians go to to achieve optimal slurry properties. They must constantly fine-tune the contents of slurry tanks (because the age of the slurry, the slip returns, dissolving sulphates from molds and the recycling of scrap all change the rheology). If sulphates are present they add a little barium carbonate to precipitate them. 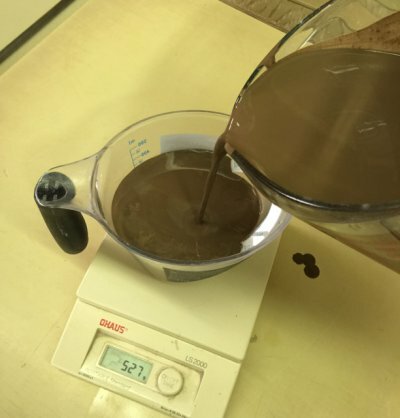 Then, using a lab viscometer to measure the viscosity and thixotropy, they bring the slurry into a condition of slight under-deflocculation and higher-than-needed specific gravity (this is practical because they have powerful slurry mixing equipment). Deflocculant is added to reduce the thixotropy to 5 degrees over the required value. Then water is added to increase fluidity to the required value (this usually brings thixotropy in line also). Vigorous mixing is then done (especially if barium was added). Aging is also often done (from 1 to 5 days) to get optimal casting performance. When one has done a few of these discovery methods of determining the best powder, water, deflocculant recipes he/she is empowered to evaluate and adjust existing slurries and add scrap material to slurry mixes. Unfortunately it is very common for slip casters to know nothing about the above, believing that a recipe can simply be followed and by magic, a delicately balanced slurry will be produced. Many will work for years with substandard slip without knowing it, others will throw away all scrap rather than reprocessing it simply because they do not understand slip rheology. A common mistake is mixing slips using plastic clays intended for modelling or sculpture (these are not permeable and shrink too much, far better casting slkips can be made using mixes of materials that emphasize permeability instead of plasticity). Notwithstanding these things, when people can accept a lower specific gravity (e.g. 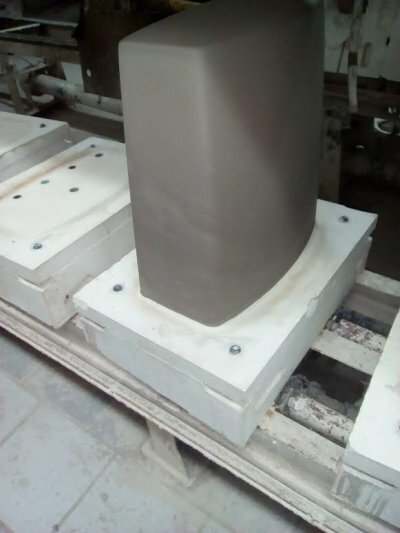 1.6 or 1.7) production can actually be done on easily-cast shapes with poor quality slip. 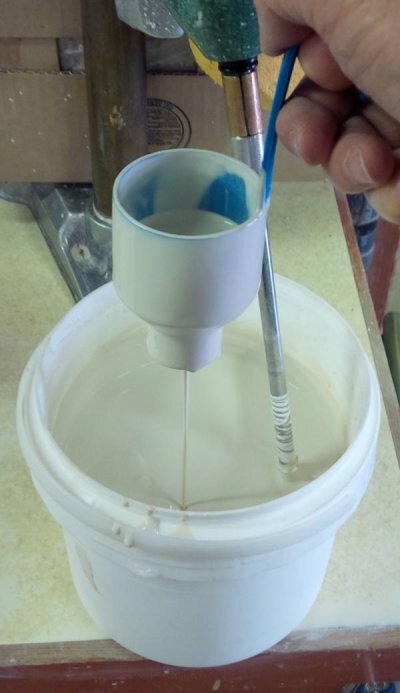 If you are starting out with casting slips, perhaps targetting a lower-than-normal-but-easier-to-mix specific gravity of 1.7 would be a good start. Be careful not to make the slip too thin or it will settle out. Aim for bringing the slurry into a state of controlled flocculation. This is where there are enough repulsive forces present to cause the system to gel after a period of time (this prevents it settling out). Such slip stops short of complete deflocculation in the interests of achieving a slurry with better working and suspension properties. What if you only have a clay body and no amounts for the water or deflocculant. Then use the above recipe as a guide. You risk loosing the first attempt so make a smaller amount. Keep good notes and learn for the next one. An account at insight-live.com is a good place to log this sort of information so it is always there when you need it. As the amount of defloccuant is increased the viscosity drops and the slurry becomes more and more fluid. However, at some point, the slurry will begin to become more viscous with increasing deflocculant percentages. This underscores the importance and tuning your casting slip recipes to avoid this problem. It is actually better to deflocculate to a point before the curve reaches its minimum (where the slop is still downward). This "controlled state of flocculation" enables the slip to gel after a period of time (to prevent sedimentation) and avoids the issues that come with over-deflocculation. A casting slip of 1.9 specific gravity. Should we use it? A hydrometer is being used to check the specific gravity of a ceramic casting slip in a graduated cylinder. Common traditional clay-containing ceramic slips are usually maintained around 1.75-1.8. In this case the slurry was too heavy, almost 1.9. Yet it is very fluid, why is this? It has both too much clay and too much deflocculant. While it is possible to use such a slip, it will not drain as well and it will gel too quickly as it stands. It is better to settle for a lower specific gravity (where you can control the thixotropy and it is easier to use). It might have been better to simply fill a 100cc cylinder and weigh it to get the specific gravity (slurries that are very viscous do not permit hydrometers to float freely). In this instance, the slurry forms a skin a few minutes after the mixer has stopped. Casting recipes do not travel well. Over-deflocculation is a danger when simply using the percentage of water and deflocculant shown. Variables in water electrolytes, solubles in materials, mixing equipment and procedures, temperature and production requirements (and other factors) necessitate adapting recipes of others to your circumstances. Add less than the recommended deflocculant to try and reach the specific gravity you want. If the slurry is too viscous (after vigorous mixing), then add more deflocculant. At times, more than what is recommended in your recipe will be needed. After all of this you will be in a position to lock-down a recipe for your production. However flexibility is still needed (for changing materials, water, seasons, etc). This deflocculated slurry of 1.79 specific gravity (only 28% water) has just been poured into a mold. 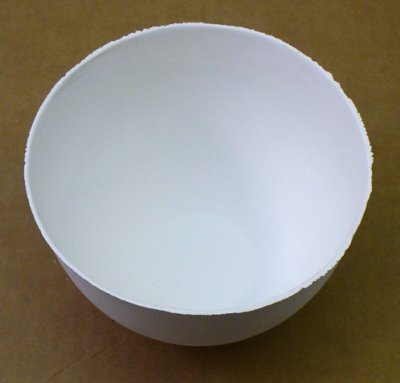 The mold is dry, the wall thickness of the bowl will build quickly and the liquid level will sink only slightly. The mold can be drained in minutes (for a wall thickness of 3-4 mm). The clay is not too plastic (too fine particle sized) so it is permeable enough to enable efficient water migration to the plastic face. If the specific gravity of this slip was too low (too high a percentage of water) the liquid level would sink drastically during the time in the mold, take longer to build up a wall thickness and water-log the mold quickly. If the slip contained too much deflocculant it would cast slower, settle out, form a skiln and drain poorly. If it had too little deflocculant it would gel in the mold and be difficult to pour out. Can you mix all this powder into that little water? 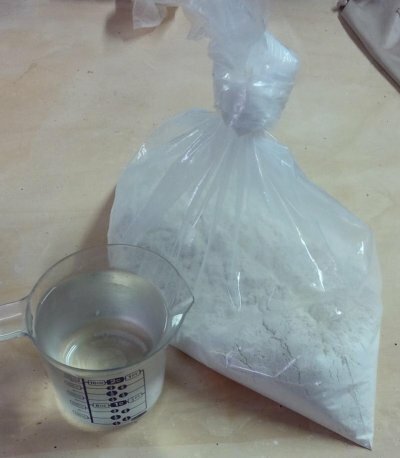 This is 568cc of water and 1400 grams of Polar Ice porcelain casting clay. Amazingly enough it is possible to get all that powder into that little bit of water and still have a very fluid slurry for casting. The volume will increase to only 1065cc. How is this possible? That water has 13 grams of Darvan 7 deflocculant in it, it causes the clay particles to repel each other such that you can make a liquid with only little more water than is in a throwing clay! All it takes is 15 minutes under a good power propeller mixer (in a bigger container of course). Sanitary ware factories optimize their slips to have the lowest possible specific gravity for production volume reasons. Potters would be happy with 1.7 SG whereas numbers approaching 1.9 SG are common in factories. They often teeter on the edge of issues like this (sections softening causing localize warping) and inexperienced technicians can be unaware of the critical balances needed to prevent loss in production. 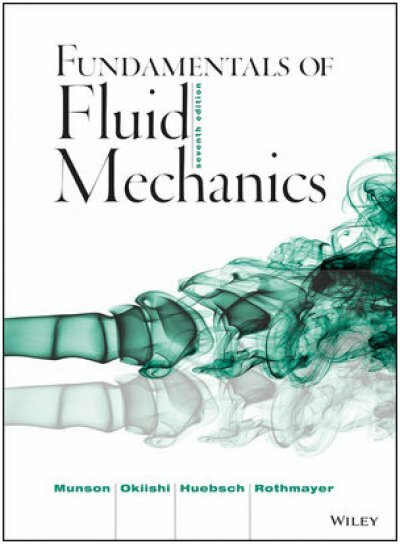 Many aspects of ceramic production relate to the control of fluids (mostly suspensions). This is also true of material production. If you want to solve problems and optimize your process this is invaluable knowledge. This book is available at amazon.com. A video of the kind of agitation you need from a power mixer to get the best deflocculated slurry properties. This is Plainsman Polar Ice mixing in a 5 gallon pail using my mixer. Although it has a specific gravity of 1.76, it is very fluid and yet casts really well. These properties are a product of, not just the recipe, but the mixer and its ability to put energy into the slurry. Cast to only 1mm wall thickness? NZ Kaolin+VeeGum can. This cast bowl (just out of the mold and dried) is 130mm in diameter and 85mm deep and yet the walls are only 1mm thick and it only weighs 89 gm! The slip was in the mold for only 1 minute. What slip? A New Zealand Halloysite based cone 6 translucent porcelain. This NZ material is fabulous for casting slips (it needs a little extra plasticizer also to give the body the strength to pull away from the mold surface as it shrinks). 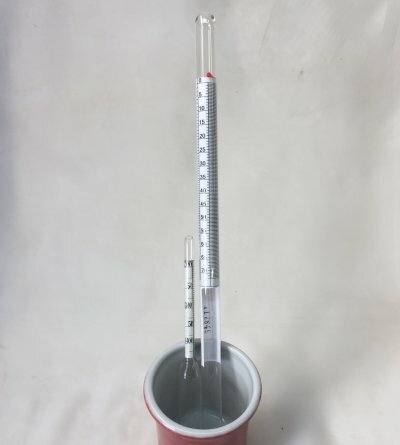 This is the easiest way to measure the specific gravity of a glaze if it is not in a container deep enough to float a hydrometer (or if it is too viscous to enable free movement). Just counterbalance the empty graduated cylinder to zero (you can buy these at amazon.com), fill it to the 100cc mark and the scale reading divided by 100 is the specific gravity. Be careful on cheap plastic graduated cylinders like this, check them with water and mark the true 100cc mark if needed. You could actually use any container, just fill it with water and mark the level, then fill to the same level with slurry and divide the slurry weight by water weight. All that powder with that little water for a casting slip? This is 8.4L of water (in the bottom of that pail) and a 20kg bag of Polar Ice porcelain casting clay. Amazingly enough it is possible to get all that powder into that little bit of water and still have a very fluid slurry for casting. The volume will increase to only 2/3 of this 5 gallon pail. How is this possible? That water has 100 grams of Darvan 7 deflocculant in it, it causes the clay particles to repel each other such that you can make a liquid with only little more water than is in a throwing clay! All it takes is 15 minutes under a good power propeller mixer. A Ford Cup being using to measure the viscosity of a casting clip. These are available at paint supply stores. It drains water in 10 seconds. This casting slip has a specific gravity of 1.79 and we target a 40-second drain. Maintenance of viscosity and specific gravity are vital to an efficient process in slip casting. The specific gravity of a glaze slurry is simply its weight compared to water. Different glazes optimize to different specific gravities, but 1.4 to 1.5 is typical (highly fritted glaze are higher). To measure, counter-weigh a plastic measuring cup on your scale and fill it with 500 grams of water and note how high the water fills it (hopefully to the 500cc mark!). Fill the container with your glaze to the same place. Divide its weight by the number of ccs (in this case, 500) and you have the specific gravity. The more you weigh the more accurate is the test. Drip glazing and bare outsides: Deceptively difficult. Why? Glaze fit. 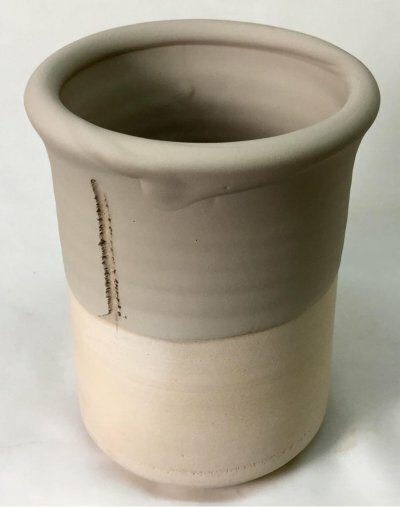 These are available on Aliexpress (as Drip Pottery) and they are made by a manufacturer that has close control of body maturity (and thus strength) and a dilatometer to precisely match the thermal expansion of the glaze. 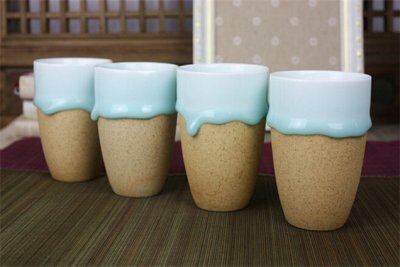 The glaze has to fit better than normal because of the absence of an outside glaze. Too low an expansion and it's compression (outward pressure) will fracture body (because these are thin-walled pieces). Too high and it will craze. And that thick glaze? It will shiver or craze with far less forgiveness than a thin layer. And how did they get the glaze on this thick? They deflocculated it, up to 1.7 or more, glazed the inside, let it dry, then glazed the outside. These pieces are a visual and technical achievement. If you are a potter you had best think twice before attempting the same. If a glaze has already been mixed and gelled to give it thixotropy these things won't bob up and down to home in on the right level. If the glaze is watery enough there are other issues. The one on the right has a 1.0-1.7 scale. Since most pottery glazes need to be 1.4-1.5 specific gravity (40-50 on this scale) it is difficult to get a very accurate reading. And it is long, you will need a container tall enough to float it and enough glaze to fill it. The small hydrometer appears better, it has a scale of 1.2 to 1.45. But it really bobs up and down (so it is even more important that the slurry be runny and thin to give it the freedom to do so). It is better to weigh a measured volume of glaze slurry and calculate the SG instead. The easiest is a 100cc graduated cylinder (from Amazon.com), if 100 ccs weighs 140 grams, that is 1.4 specific gravity. Glaze at 1.7 specific gravity on green-ware. Way too thick! This is G2926B clear cone 6 glaze deflocculated with Darvan. Because the Darvan is thinning it, 2.5kg of glaze powder is suspended in only 1100g (1100ml) of water (half the normal amount). While the slurry in the bucket flows well and appears like it should work, a one-second dip produces twice the desired thickness. It dries slowly and it is very difficult to prevent runs. The lesson: Make sure the specific gravity (SG) of your glazes is right. What should the SG be? Measure it when your glaze is working well. Or take note of it in instructions that come with the recipes you use. For bisque ware: 1.43-1.45 with a flocculant (like Vinegar or powdered Epsom Salts) added to gel the slurry slightly. This article helps you understand a good recipe for a red casting body so that you will have control and adjustability. Understanding the magic of deflocculation and how to measure specific gravity and viscosity, and how to interpret the results of these tests to adjust the slip, these are the key to controlling a casting process. 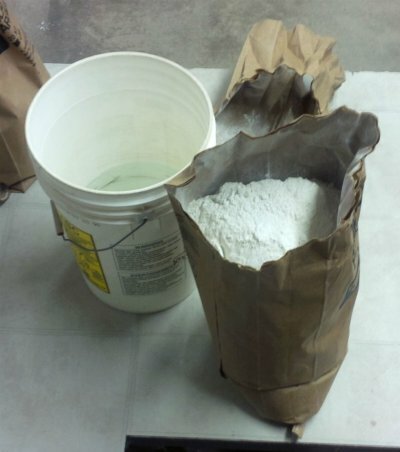 The classic white ball clay talc casting and modelling recipe has been used for many years. It is a dream to use as long as you are aware of the problems and risks.